THIS IS THE BIG PINK ONE. You Save BIG $$$$'s if you win it now!!! Don't make the mistake...many sell a similar looking bike. Be careful...they may look like it but they may be a lot smaller than this one. This is the biggest model of the kid's electric bike. It has the 15 inch wheel. The smaller bike looks a lot like it but the wheels are about 10 inches. So the big one is really the one you want. 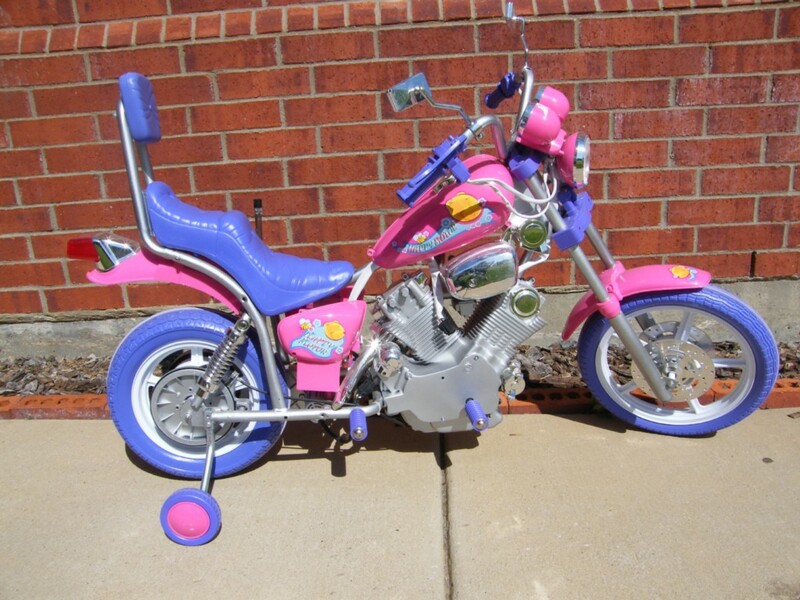 The same 3 year old can ride either this big bike or the smaller version some sellers sell. But all kids older than 4 really need the big bike. THIS IS THE BIG BIKE. GO SEE FOR YOURSELF...THEN BUY IT NOW FROM US! We have plenty of other bikes like this one in our Store...Big ones and Small ones..Just go the store and type Motorcyle. SUGGESTED RETAIL OF THIS ITEM: $499-$599. This is one hot deal! For kids 3 yrs old to kids up to 90 Lbs. Yes this is a whopper of a deal. You don't have to be a fisher to make this great catch. Don't be confused. There are others selling a smaller version of this. The smaller ones look like this but they don't have the power to support 90 lb kids...much less the size and room. You might even try to compare to the 1947 Indian...but there is no comparison. Those are really designed for kids under 55 lbs. This one is for the little ones and the big ones up to 90 lbs. Also...this has the throttle switch and not a footpedal that the smaller model has. see pictures below to compare. Every Dad want his kids to ride the big one. Until now, they had to wait until their teens. NOT ANY MORE!!! 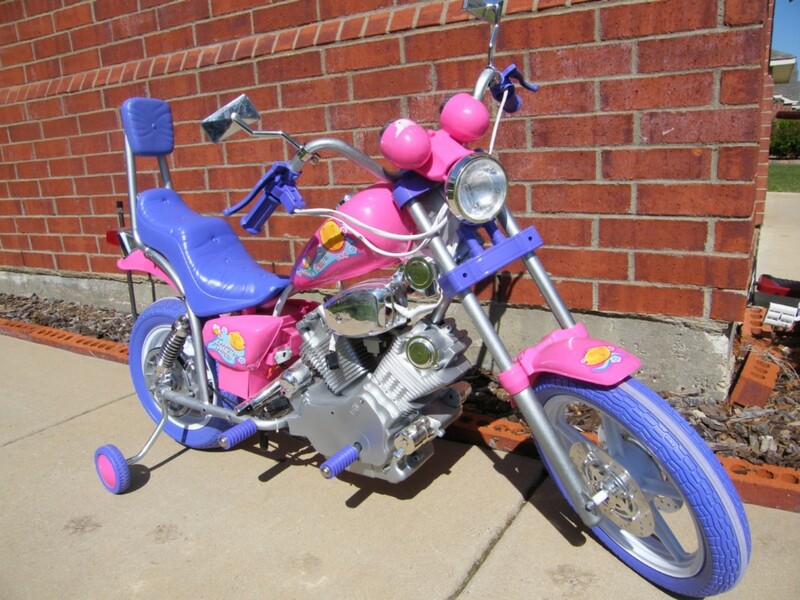 This motorcycle has is made to replicate the Big One you ride. Uses rechargeable batteries for many hours of outdoor fun! SUGGESTED RETAIL OF THIS ITEM: $499-$599. This is one hot deal! Oh don't forget the large 15 inch wheels. Can support a child up to 90 lbs. Tires are sturdy molded plastic with rubber center for grip. It is 47 inches long. The seat is 18 inches from the ground. It is 36 inches from the ground to the mirror. That's 3 feet! Charging unit is 110/220. AND It is included!!! Battery is 6 volts. AND It is included!!!! Charge time is 6 to 8 hours. Comes with a set of training wheels. Exchange and refund policy: All items are sold new in the box. Although we don't ever anticipate any issue with the item, we do have a policy to cover the potential of issue with this item. Most often if there is an issue mechanically with this item, it is something that can be resolved quickly through a few trouble shooting efforts that can be coordinated via email or over the phone. Simple diagnosis of the issue will result in correcting it without much effort. If it is determined that parts are needed, we will ship the parts or reimburse you for the small parts purchased that will resolve the issue. This does require that the buyer will participate in the troubleshooting and small part replacements that are normally very easy. More complicated repairs can be done at our facility as a last resort if our trouble shooting efforts don't correct the problem on the buyer end. Buyer will then ship the item back to us and we will facilitate the correction and return the item to you. Normally buyers are responsible for all shipping so correcting it on the buyers end is the most preferred resolution. We will accept returns for refunds but please be aware that the buyer is responsible for the cost of returning the item to us and we will refund the cost of the item only and not original shipping costs since the cost of shipping is actually a third party charge. Please be aware that this policy is valid for 30 days after the purchase. Any issues must be reported prior to the 30th day after your completed purchase. Please inspect your item carefully upon arrival. As an extended service that is not offered by most of our competitors, after thirty days, we will still help troubleshoot and we will offer any needed parts at our cost which saves you money. Again, we never anticipate issues, but this is our policy for all ride on toys.